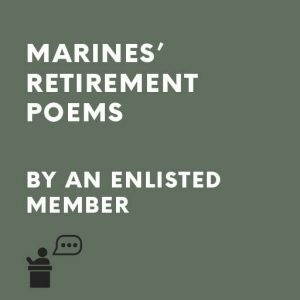 These marines’ retirement speeches are ideal for you if you are addressing enlisted members who are retiring. They speak of duty done and the ongoing need to defend democracy. They mention the camaraderie in the forces and they look into the future of the marines saying that what they have learnt will stand to them in their new life. They end with a good luck wish. The short poems offer you the opportunity to end your speech on a memorable note. If you are a Commanding Officer and have to give a Marines’ enlisted member retirement speech by Commanding Officer what would you think it appropriate to say? Why not order a speech pack from us that will save you time and trouble? Each speech in the pack speaks of duty done and the ongoing need to defend democracy. They mention the camaraderie in the forces and they look into the future of the marines saying that what they have learnt will stand to them in their new life. Each Marines’ enlisted member retirement speech by Commanding Officer ends with a good luck wish. You may use one speech individually or mix and match selected pieces. Our short poems offer you the opportunity to end your speech in a most surprising way.